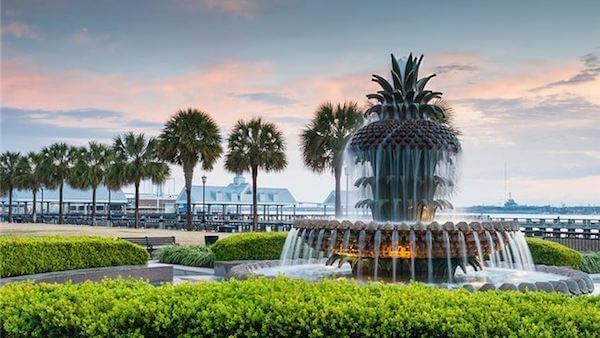 Every year, visitors flock to downtown Charleston in search of a relaxing getaway, family adventure, the perfect spot for their dream wedding, or an ideal location for a corporate business meeting. It’s no wonder! With rich history, award-winning restaurants, exclusive shopping, and lively events at every step, there is something for everyone in Travel + Leisure’s “World’s Best City.” And when you stay at The Charleston Chestnut Mansion, not only are you staying at the best place to stay in Charleston, you are also just steps away from all our city has to offer. As one of the United States’ oldest cities, Charleston is a major draw for you history buffs. Charleston was a focal point in both the Revolutionary and Civil War — many monuments, landmarks, and tours are within just a few blocks of The Charleston Chestnut Mansion. Did you know Charleston is nicknamed “The Holy City” thanks to our breathtaking skyline of church steeples? You don’t even have to go outside to experience why we earned this nickname! You can see the famous steeple of St. Philip’s Episcopal Church, South Carolina’s oldest church, from your living room window in The Charleston Chestnut Mansion’s Suite 200. Take a stroll down to The Battery & White Point Gardens (a 1-mile walk) to see Charleston’s most famous houses — beautiful, pastel-colored Antebellum mansions lining the street — as well as war memorials, pirate epitaphs, and an impressive array of Civil War mortars and cannons. Once you’ve explored the grounds, enjoy a picnic lunch and the expansive views of Fort Sumter and the Atlantic Ocean. Hop on a Fort Sumter Ferry (a 15-minute walk) to get an inside look at where the Civil War began. While you cruise through the Charleston Harbor to get there, you will probably catch a glimpse of dolphins jumping! Charleston’s rich culinary scene is fast becoming a cornerstone of our culture. From seafood and fine dining to oyster roasts, brisket, and everything in between, delight your inner foodie and sample the best of Lowcountry cuisine — all within walking distance of The Charleston Chestnut Mansion. For those who prefer the comforts of homemade fare, a Harris Teeter grocery store and a liquor store are within a 5-minute walk. The Charleston Chestnut Mansion also offers a concierge service if you prefer to have the pantry stocked before you arrive. Entertainment options are endless when you stay at The Charleston Chestnut Mansion! There is always something to do in Charleston. Locals and tourists alike enjoy the weekly farmers market at Marion Square, superb shopping on King Street, and larger events like Spoleto and the Southeastern Wildlife Exposition. In addition to these larger events, there is more than enough to keep you occupied during your stay here. Every single day we enjoy walking tours through secret gardens and haunted cemeteries, soaking up the sun at pristine beaches, browsing through art galleries and antique shops, plantation tours, golf, and so much more. Charleston City Market — Take a one-block stroll from The Charleston Chestnut Mansion to find the historic Charleston City Market, a favorite of locals and visitors alike. The Market spans from East Bay Street all the way to Meeting Street and is filled with 300 local vendors (including sweetgrass basket weavers). Antiquing on King Street — Charleston is also famous for its shops filled with one-of-a-kind antiques. Treasure hunters can spend days trekking up and down the 100 to 300 block of King Street (3 blocks from your vacation rental). Local Boutiques — Looking for more current styles? Bustling stores from local business owners and national brands line King Street. Museums — Throughout downtown, Charleston displays her proud history in many museums, historic homes, and churches, referred to as the Charleston Museum Mile. Start at America’s first museum, The Charleston Museum (a 1-mile walk), and work your way down Meeting Street for an enlightening journey through Charleston’s history, culture, and arts. Gaillard Center — Enjoy the arts with a variety of performances at the Gaillard Center (a 10-minute walk). Make Your Vacation a Spa Retreat – Earthling Day Spa is next door to The Charleston Chestnut Mansion. They offer massages, facials, body treatments, nail treatments, Pilates classes, and more. Ready to take advantage of all Charleston has to offer? Stay in one of our luxury vacation rentals in the heart of downtown Charleston by contacting us today.